Over the years, environmental elements such as UV rays and pollution can take a toll on your skin. Fine lines, age spots, and “crow’s feet” can appear as a result. Microdermabrasion can reverse the signs of aging by removing dry and dead skin cells from the top layer of your skin, creating a more radiant complexion. At Summit Plastic Surgery & Med Spa in Kansas City, MO, our licensed estheticians are ready to help you create a plan to meet your individual skin care needs. Microdermabrasion is a non-invasive skin care procedure that uses small crystals to remove the outer layer of dead skin cells from the face to reveal younger-looking skin. The procedure is different from many other facial treatments because it does not involve the use of chemicals. In addition to removing dead skin cells, microdermabrasion also facilitates the production of new skin cells to create younger, healthier-looking skin. The best candidates for microdermabrasion are healthy adults with realistic expectations concerning the outcome of the procedure. Who Should Not Undergo Microdermabrasion? Patients with these conditions may not be candidates for facial treatments, or they may benefit from a more dramatic intervention, such as a glycolic, a chemical peel, or dermabrasion. It should also be noted that pregnant women should wait until after they have delivered their baby to undergo this procedure. In addition to removing dead skin cells, microdermabrasion also facilitates the production of new skin cells to create younger, healthier-looking skin. 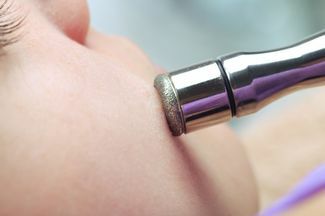 An esthetician performs microdermabrasion using a special tool with a diamond tip or a wand that directs a stream of small aluminum oxide crystals to the skin. Both methods result in the outer layer of dead skin being removed, the pores being opened, and the dead skin being drawn away from the face. In addition to exfoliating dead skin, the treatment will also replenish facial skin cells. The procedure is comfortable for most patients, as it creates a warming sensation along with gentle vibrations. Each microdermabrasion treatment lasts about 30 to 60 minutes, and the esthetician will determine if multiple sessions will be needed to help you achieve your desired outcome. After the procedure, most patients can return to their normal activities immediately. To protect the new layer of skin, patients should avoid direct sunlight after microdermabrasion, and they should apply sunscreen and moisturizer as needed. Patients who are experiencing minor skin problems such as wrinkles, sun damage, or acne scars should reach out to Summit Plastic Surgery & Med Spa. You can contact us online or by calling (816) 347-0026 to speak with our staff to determine if quick, gentle microdermabrasion is the right solution for you.